Pictured, left to right: Dr. Alan Grant, Dean of the Virginia Tech College of Agriculture and Life Sciences; Dr. Charles Covell, Jr.; Dr. Dixie Dalton, President of the College of Agriculture and Life Sciences Alumni Organization; and Dr. Tim Kring, Head of the Virginia Tech Department of Entomology. 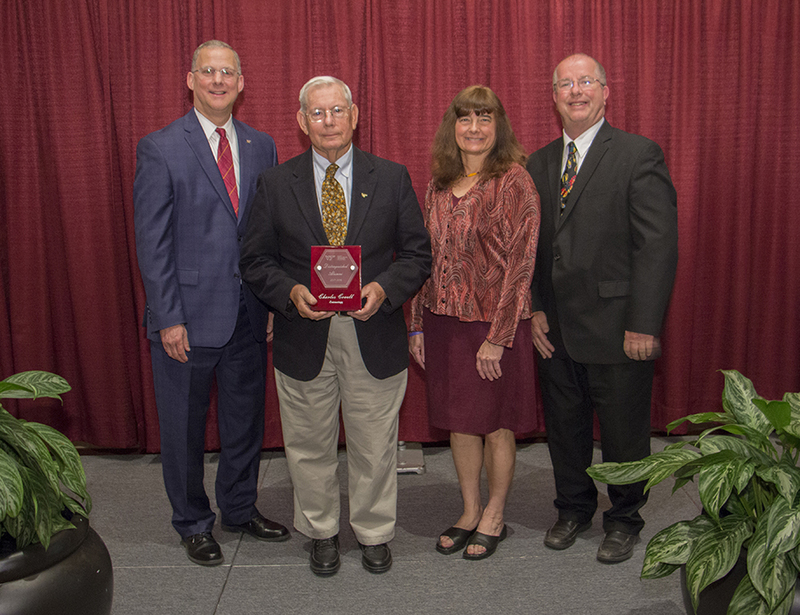 Charles Van Orden Covell, Jr., Ph.D., was named Distinguished Alumnus for the Department of Entomology of Virginia Tech’s College of Agriculture and Life Sciences on April 20, 2018, at the annual college alumni awards ceremony. Covell works as the curator of moths and senior research scientist at the Florida Museum of Natural History in Gainesville. Prior to his position there, he retired from the University of Louisville as Professor Emeritus of Biology. As curator of the Lovell Insect Museum at Louisville, he expanded the collection from 50,000 specimens to well over 250,000. Covell has received a great amount of recognition throughout his illustrious career; most recently, however, he was named a research associate for the Smithsonian National Museum of Natural History in Washington, DC. Charlie is also an Honorary Life Member of the Lepidopterists Society.